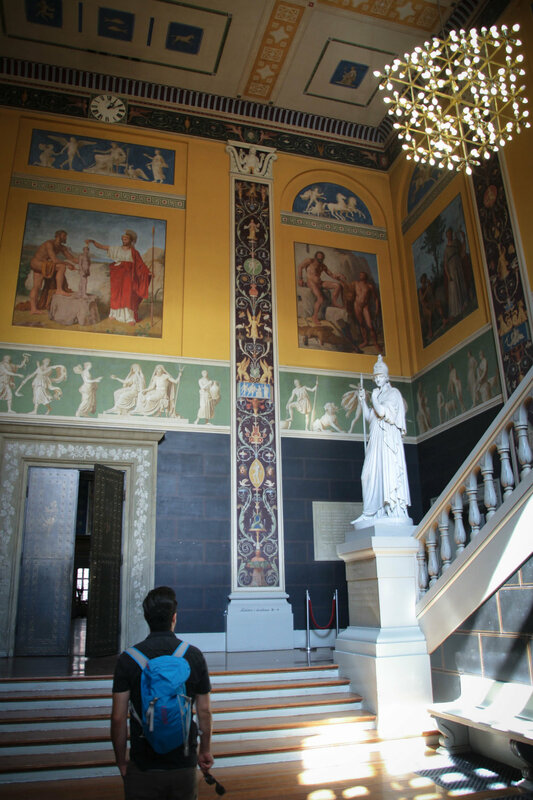 Copenhagen, the capital of Denmark, has a history that dates back to 1043. Notorious for unpredictable weather, this coastal city is full of beautiful museums, buildings, and other historic landmarks. 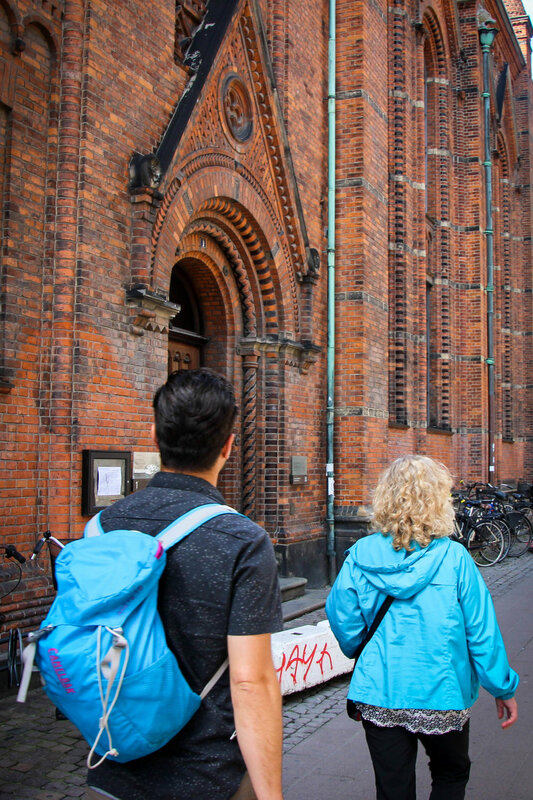 Perhaps the best way to understand Copenhagen’s rich history, however, is to learn about the culinary traditions by eating throughout the city. 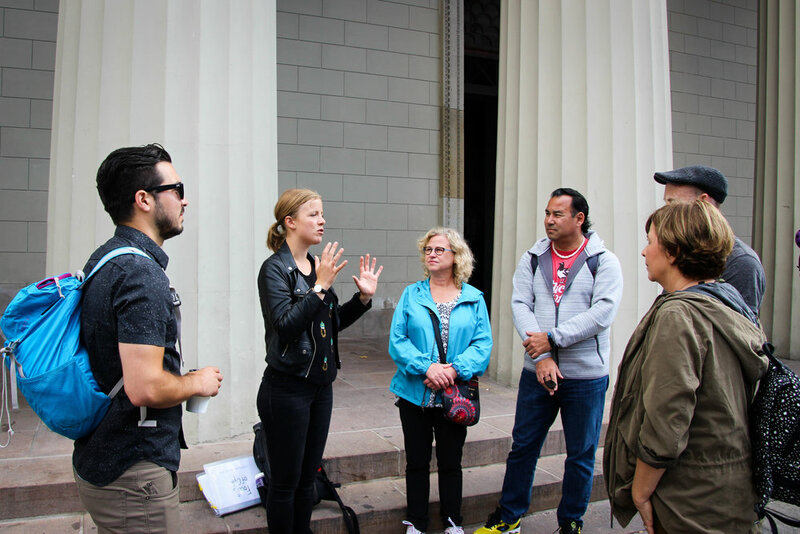 Thus, I joined Foods of Copenhagen for a 4-hour tour around this burgeoning city rich in history and culinary traditions. Why do so many people come to Copenhagen just for the food? The New Nordic Manifesto, written in 2004, popularized and captured the essence of Nordic cuisine: seasonality, freshness, simplicity, locality, sustainability, and self-sufficiency. Some of these buzz words are liberally used in the food world, but here in Denmark, they take this code to heart. 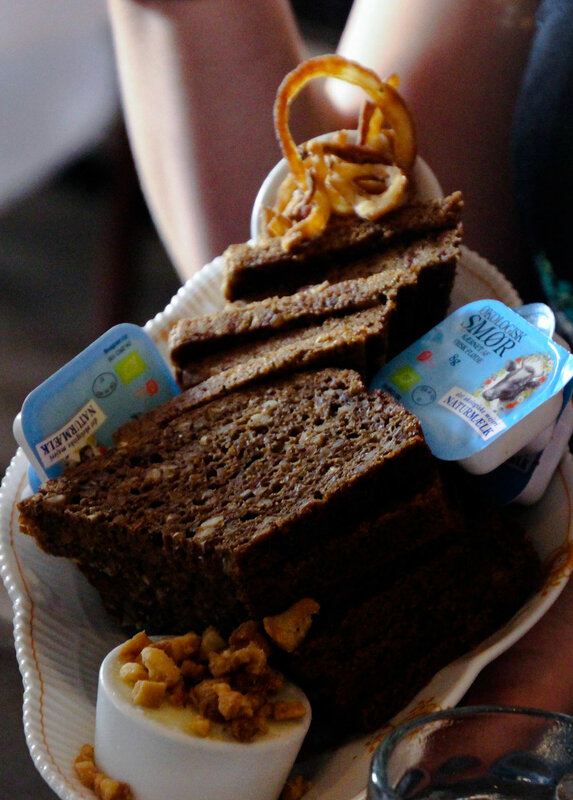 The foundation of smørrebrød is rugbrød, or rye bread. Rugbrød, is the most popular savory bread eaten in Denmark, and it is found at nearly every meal. Packed with different seeds, grains, and cracked rye, this dark and dense fermented sourdough bread creates a perfect vessel for robust toppings, which is why it is the bread of choice for smørrebrød. With nearly every lunch spot in Copenhagen serving up their own rendition of smørrebrød, choosing a spot to dine can feel overwhelming. However, our guide Fie simplified our decision and led us to a unique spot not only with great food, but also with a wealth of local history. Right next to the square stands the first restaurant in Denmark where women could dine without a male counterpart. After a day of selling goods at the market on the town square, women would frequent this classic Danish restaurant to get their fixing of smørrebrød. In DIY fashion, they would pile toppings such as pickled herring, capers, and onions onto the butter-smeared rye bread. Similar to the women who dined over a century before us, we ate our rye bread with curried pickled herring, pork meatballs, and pickled cabbage. A glass of Danish schnapps accompanied our meal, as is typically done when eating pickled herring at lunch. Unpredictable Scandinavian weather calls for hearty foods. 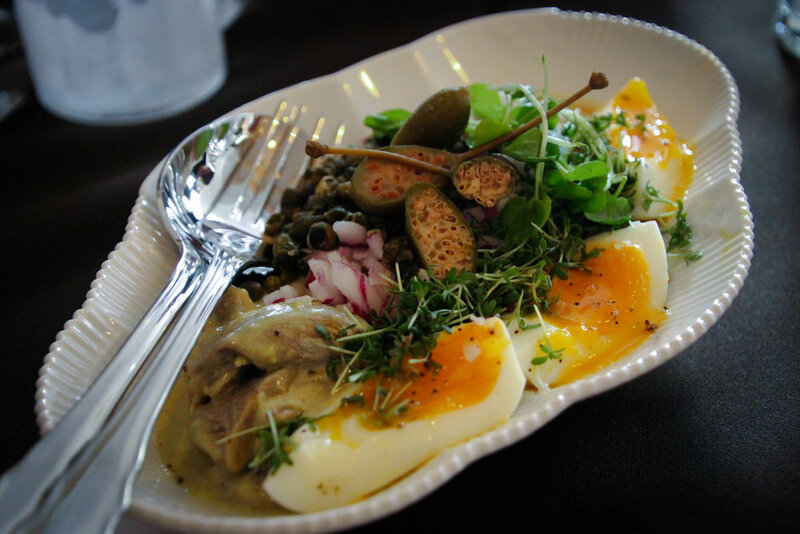 Pervasive throughout Nordic cuisine are foods preserved with techniques such as smoking, salting, and pickling. No matter the season, the Danes are conscientious of getting the best foods on their plates year round. 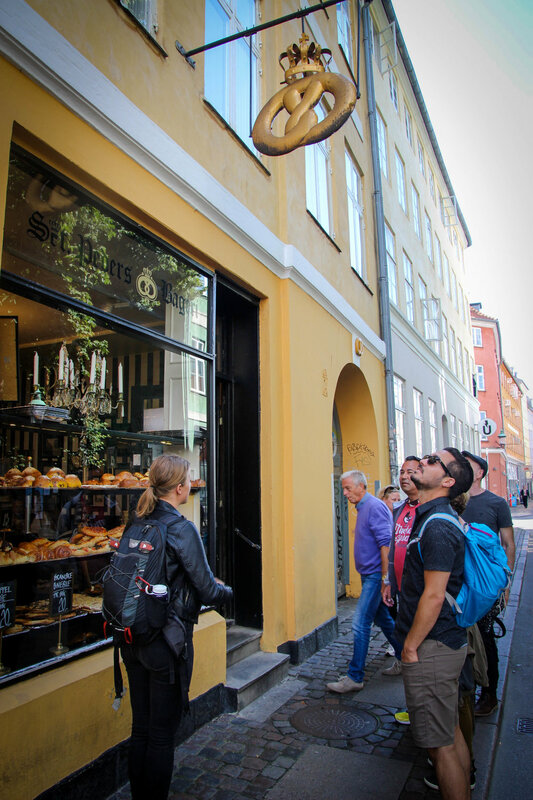 After a classic Danish lunch, we shuffled to the oldest bakery in Denmark famous for the 4,000 cinnamon rolls that they sell only on Wednesdays. Doing the tour on a Sunday, we instead tasted custard-filled pastries that had a hint of almond essence. The buttery, yeast-leavened dough is mixed with cream, eggs, and sugar, making it sweet and rich flavor. The chilled dough is also folded to give it the buttery layers, so when I ripped off a piece of the Danish, the crust delicately flaked off. Perfecting the art of the Danish pastry, I may even opt for these delicious custard rolls over the famed cinnamon rolls. The technique for making Danish pastries actually comes from the Viennoiserie tradition, by way of Austria. History credits the introduction of the famed Viennese pastry after a strike amongst bakery workers in Denmark in 1850. Avoiding the demands of the strikers, bakery owners instead hired workers from abroad – many of whom came from Austria. The immigration of Austrian bakers brought a wave of new baking techniques that became so beloved, that even after the strikes ended, the recipes stayed put and made a name for themselves in Denmark. Thus, the Danish-pasty as we know it today is actually an amalgamation of Viennese and Danish traditions. For our next tasting we head to Torvehallerne, a glass encased market in the city center showcasing all things local. We headed to a cheese stand to taste some local Danish cheeses including a gouda cheese, crystal cheese (named after the crystallized milk proteins), goat cheese, and blue cheese. Fie even carried with her a special cherry liquor to pair with our cheeses. The range of flavors and textures of the Danish cheeses only begins to showcase the diversity of cheese options here in Copenhagen. 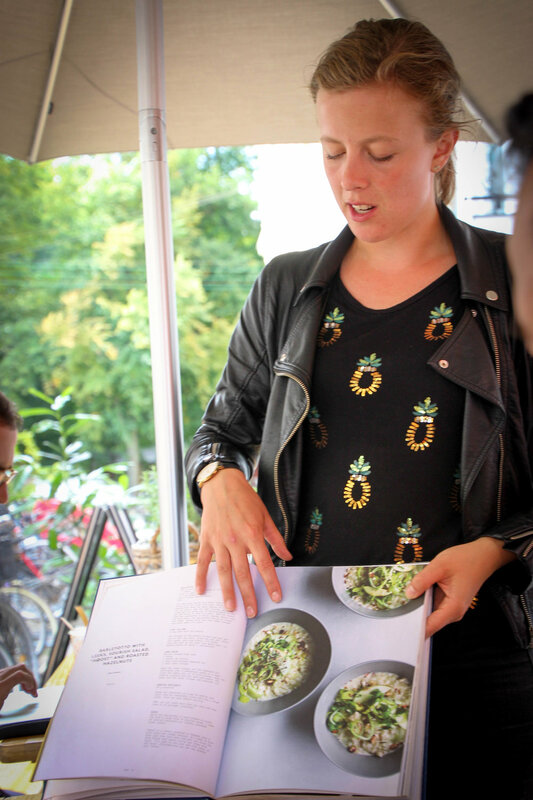 Unlike other food tours, Foods of Copenhagen goes beyond the city center to take guests to other neighborhoods that locals frequent. Thus, we ventured out of the city center to Norrebro, which is the densest neighborhood in Copenhagen. Full of start-ups, diversity, and Michelin starred restaurants, this once affordable nook in the city is steadily becoming one of the priciest neighborhoods in the city. We headed to a street only 250 feet long yet is full of some of the best cafes, restaurants and shops in Copenhagen, including: Mirabelle (incredible sourdough bread, ice cream with milk from their farm, and buttery croissants), and Baest (the best Italian-style pizza in Copenhagen). We walked to a brewery and restaurant with all homemade craft beers and fermented foods. We shared a “family style” spread of tasty, fermented dishes including: cauliflower with nigella seeds and fermented mushrooms, broccolino with broccoli sesame and quinoa, and the veggie kimchi. 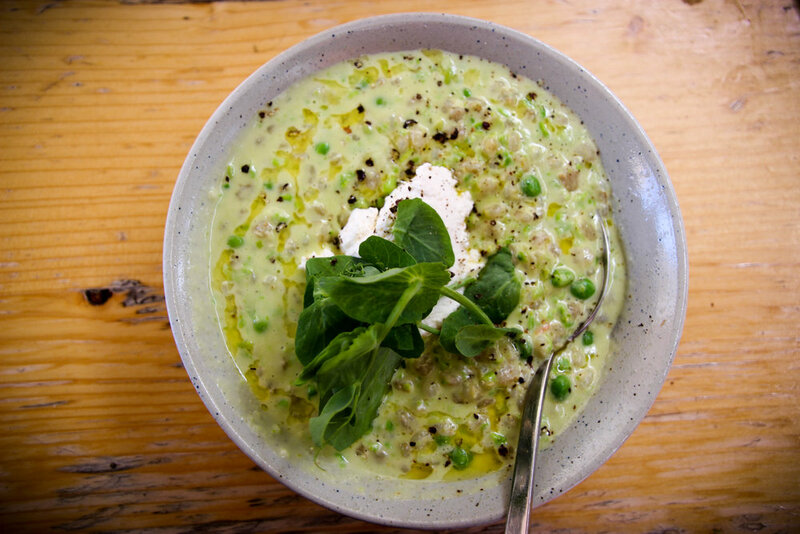 This place does homage to the fermentation and foraging food culture in Copenhagen. After our tasty bites and libations, we walked to a cemetery, which also happens to be the largest green area in Copenhagen. 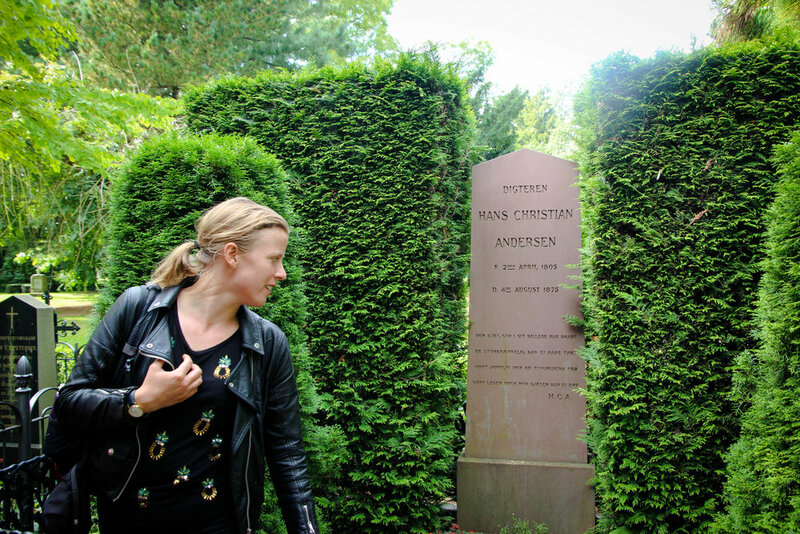 Hans Christian Anderson, the Danish fairy-tale author famous for works such as The Little Mermaid and The Ugly Duckling, lays to rest in this cemetery, which is a surprisingly welcoming and pleasant to stroll through. Being on a food tour, of course we stopped to do a tasting here as well. Fie shared with us a piece of sea salt and caramel chocolate coated licorice. Without a doubt, this was the most delicious piece of licorice I have ever tasted. Yes, the licorice was coated in caramel and chocolate, but trying high-quality licorice gave me a new appreciation for this beloved Danish treat. 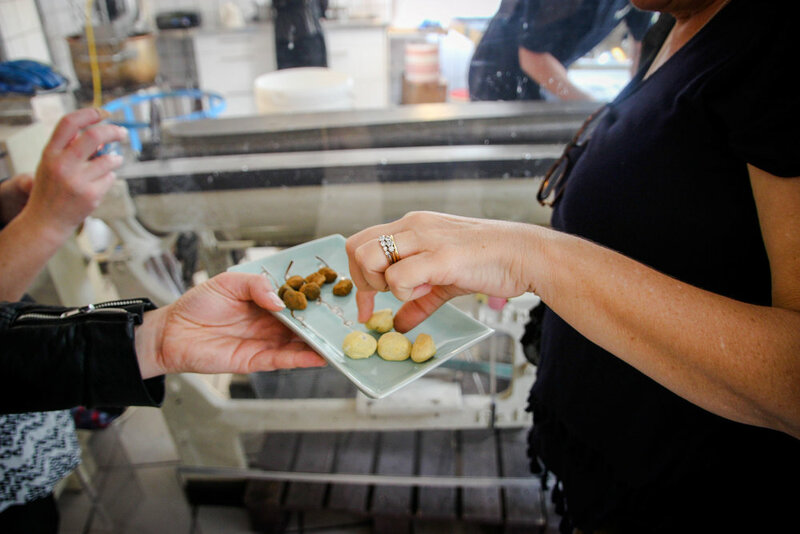 Piquing our taste for sweetness, we headed to a chocolate shop to try cream balls called flødeboller, handmade by the chef and owner - who we actually got to meet at the shop! After selecting one of three flavors of flødeboller, we bit into the thin, chocolate shell, which released a gush of the soft, mallow in our mouths. Continuing on, we had one more sweet stop before returning to savory foods. In the next candy store, workers moved long, slick slabs of caramel through candy machines built before WWII. We tried a myriad of supple, yet chewy caramels with licorice flavorings. Before this food tour I thought I did not enjoy eating licorice, but once again I was proved wrong. Further down the street is the first Scandinavian-style porridge bar in the world, which in my book receives a 10/10 on the hygge scale. This cozy spot serves breakfast porridges, as well as savory lunch and dinner porridges. Do not be fooled: this is not a place to buy mealy oats. Everything is slow cooked with real grains such as barley, oats, and spelt. They have gluten-free options and dairy-free options, so there is something on the menu for nearly everyone. We tasted the barley-otto and *pow* this was hands down the best porridge I have ever tasted. 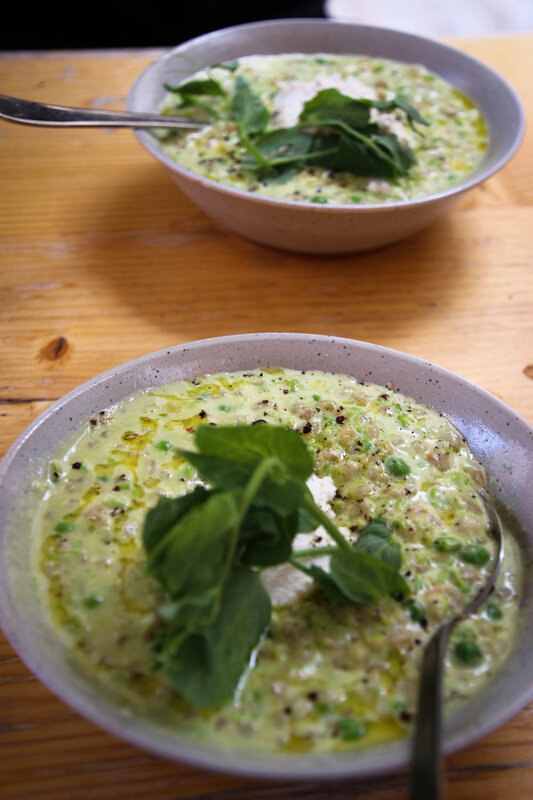 Cooked with freshly shelled green peas, mixed with vesterhavosost (Danish cheese), and topped with pea shoot, lemon oil, and the lushest ricotta cheese, this bowl of heavenly goodness could not have tasted better. Full to the brim, we had one last beverage tasting at the famous Mikkeller & Friends bar. 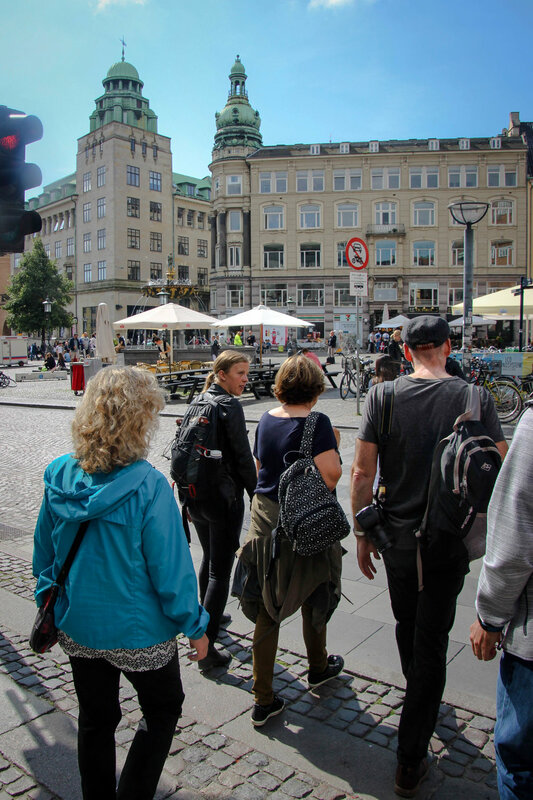 This brand of bars can be found throughout Copenhagen and the world, however the original location that we stopped at on our tour is the premier location to visit. Our bartender, who spoke with a flawless American-English accent, said he moved from Belgium just so he could work at this bar. This dedication to craft beer is unparalleled anywhere else in Copenhagen. Fie picked out a fine selection of craft beers so we could cheers to an afternoon well spent.